Eastern Regional High School is trying to get a head start on determining how many students will be taking the upcoming Partnership for Assessment of Readiness for College and Careers exam. With advance knowledge of the number of students expected to take the PARCC exam, district officials hope they might develop better alternative programing for those students who won’t be participating. As such, Eastern is requesting parents send a notification of refusal to the school via their online parental PowerSchool account by Feb. 7. By state law, Eastern is once again required to administer the PARCC exam this April for students in grades nine, 10 and 11 in English as well as algebra I, geometry and algebra II. PARCC, an entirely computer-based exam, replaced New Jersey’s former grade 11 High School Proficiency Assessment exam for the 2014–2015 school year, during which time the test was also administered to those in grades nine and 10. In the lead up to last school year’s PARCC exam, parents across the various states that partnered with New Jersey in administering the exam protested against the tests, with many refusing to allow their children to take the exam. While the state does not allow Eastern the option of granting parents permission to allow their children to “opt-out” of the exam, Eastern must still accept a parent’s refusal let a child participate. In December, Eastern released PARCC scores and participation rates from last year’s inaugural round of testing. The results showed for the English and math sections, Eastern participation rates hovered around 50 percent for freshmen, below 50 percent for sophomores and well below 50 percent for juniors. “Last year, we had a lot of students that were refusing to be involved with the test, which caused us to have extra large ‘study halls’ as places to hold those students who were refusing the test,” Eastern Principal Robert Tull said as he spoke at the Jan. 20 Board of Education meeting. 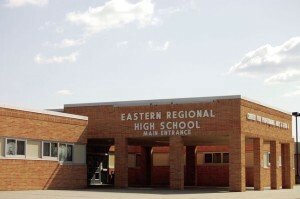 Tull said knowing how many students will be participating in PARCC increases Eastern’s chances of planning alternate schedules where students not taking the test might still be able to attend classes during the testing periods. “What we’re doing is essentially putting out the word now so the parents can make the responsible choice now and so that now we can look at programs for those students,” Tull said. In addition to exams such as the SATs or ACTs, juniors can also use scores from PARCC as their high school graduation requirement, although the first year where PARCC is scheduled to become the only available graduation requirement was recently pushed back to 2020. For those parents who refused to allow a child to take the PARCC exam last year, another refusal notification is still required this year. Absences from Eastern during the testing period will also continue to count against a child’s attendance record.